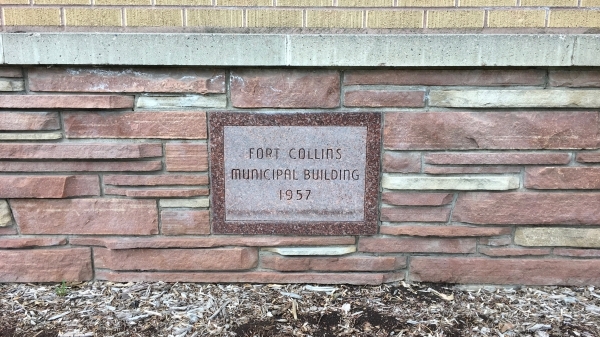 After World War II, Fort Collins experienced a population boom. Suburban style developments started popping up on the fringes of town… along West Mulberry, around Stover and Elizabeth, and some were even as far aways as Prospect Road. 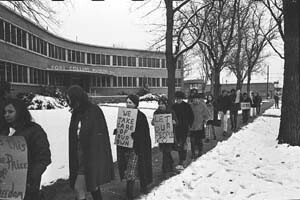 Colorado A&M was growing so quickly that some students were housed in small quonset huts, which could be added faster than more substantial housing. And through it all, the City government was growing to meet the needs of this expanding community. City offices, the fire department, and the police department used to all be located in one building, now referred to as the Old Firehouse on Walnut street. By the late 1940s, it was becoming clear that more space was needed. In 1955, a fifty-member citizen’s committee was created to determine what the City needed in a new building, how it would be financed, where the building should be located, and to gauge and guide public opinion regarding the project. John Nicol, a local real estate agent and the chair of the Planning & Zoning Board, led the committee. It was finally determined that the new City building would be located on the south end of Washington Park. Washington Place, a small street running behind houses to the west and the park to the east, was narrowed to the width of an alley in order to accommodate the new building. Local architect, William B. Robb, was employed to develop plans for the new structure. He designed the building to have three wings with a flexible interior that could be adapted over time to respond to changing needs. He included a drive-through on the east end of the building so that residents could conveniently pay their utility bills from the comfort of their automobile. The building was Modern in design, with characteristics that are distinctive in International Style architecture. Unlike the old City Hall on Walnut street, this new building had very little in the way of ornamentation. The building also had a distinctive Y-shaped design, a flat roof, long ribbons of windows, a cantilevered awning over the drive-through; and it made use of modern materials such as reinforced concrete. This overhead view from Google Maps clearly shows the Y-shaped design that Bill Robb employed. With a Y-shaped design, William Robb managed to fit the maximum number of office spaces onto the lot while still providing each room with natural light. The building had a strong front entrance facing Laporte Avenue with wings embracing each side. 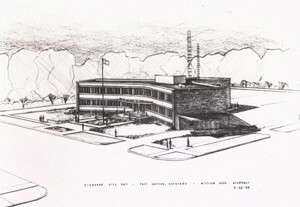 fairly new concept at the time City Hall was built. 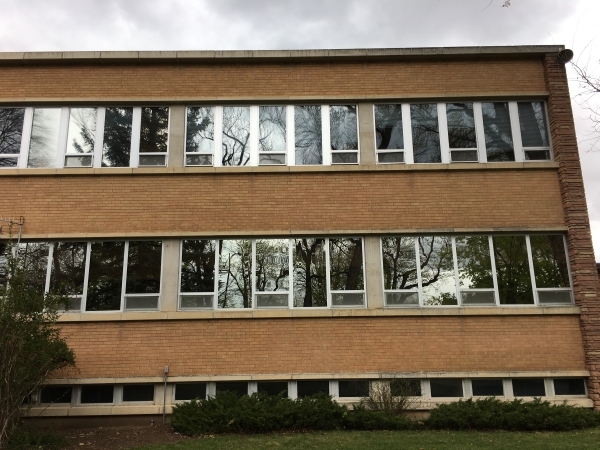 The brick and stone facade on the new City Hall reflected similar materials in use in older buildings, helping the Modern building enhance the character and feel of Fort Collins while still distinctively representing it’s own place in time. This Modern building included a very modern amenity — a drive through. Within a decade of the new City Hall opening, it was already becoming crowded. Fort Collins was continuing to grow by leaps and bounds and City services were expanding to meet the growth in demand. By 1978, an even newer City Hall was added to the northwest of this site. 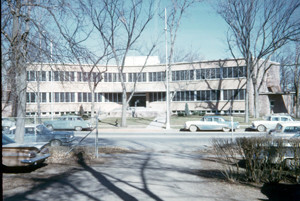 Rather than taking on an address of its own, the 1978 building was given the same address as the 1957 building — 300 Laporte Avenue. Terrazzo floors were popular during this time. Though the interior of the building has been remodeled over time, many features remain largely the same. 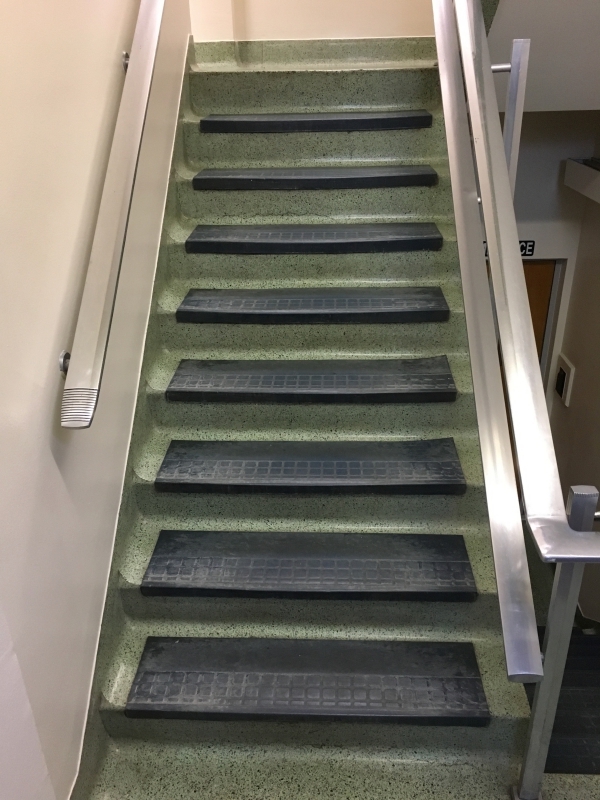 Terrazzo was also used in the stairwells. 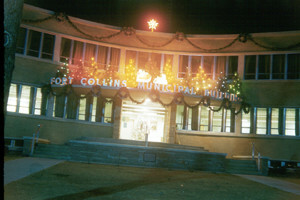 In 1992, the Fort Collins Police took over the building. 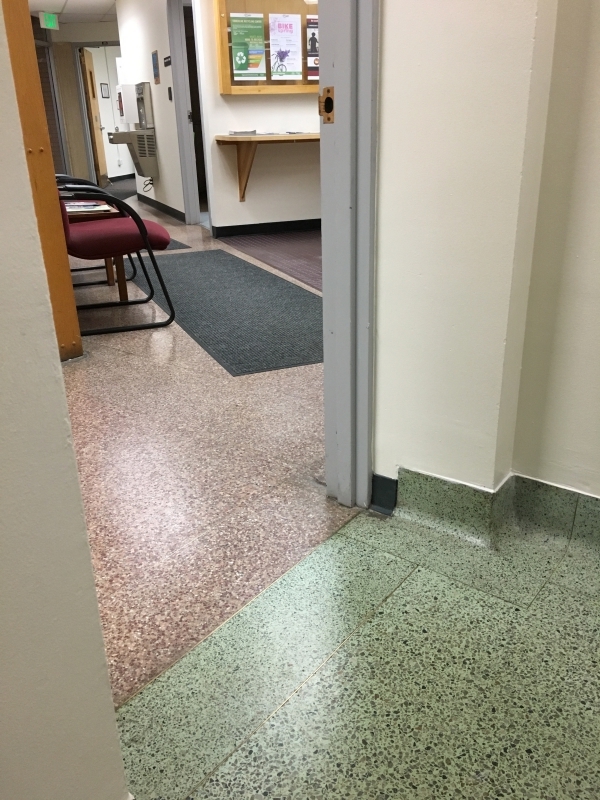 In order to increase security, a decision was made to lock two of the three entrances into the building. Soon after this decision was made, a tragedy forced a more substantial change. Stephanie Sund was gunned down by Jeffrey Thomas as she ran to the old front entrance trying to reach police protection. The locked door blocked her entry. Though she was shot three times, she managed to survive. The incident convinced the department to remove the steps to the front door, effectively closing off the old front entrance. Signs were placed around the building directing residents to the preferred entrance on the northwest side. The police department moved to a new location on Timberline road in 2007 and the building is now used by City Operations. 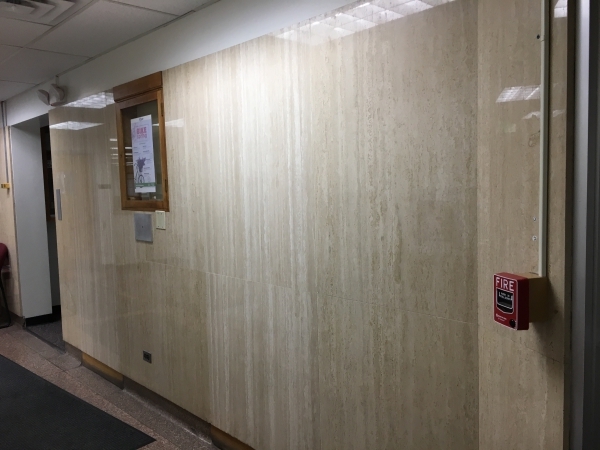 Travertine wall paneling gave the hallways a feeling of warmth. 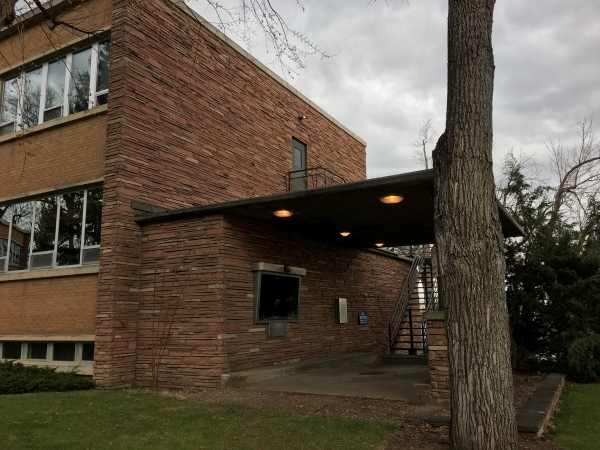 On April 19, 2017, the Landmark Preservation Commission voted unanimously to recommend that this building, as well as two others owned by the City of Fort Collins, be added to the local register of historic places. City Council will vote on the designations at their May 16th regular meeting. This “cornerstone” is neither on a corner, nor does it act as a support for the building. Buildings created without load bearing walls have no need of load bearing cornerstones. Most of the information for this article came from a report put together by Cassandra Bumgarner, a historic preservation planner with the City. I accessed this report through the Landmark Preservation Commission agenda from April 19, 2017. 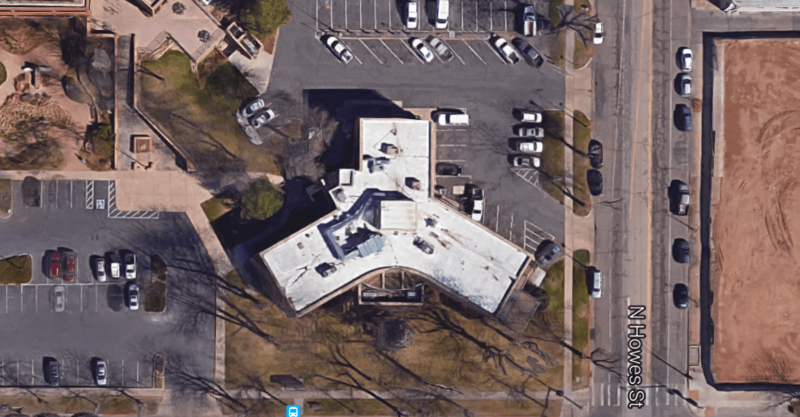 Many of the images were taken by me on April 28th, but the aerial shot of the building was captured from Google Maps, and the historic images of the building are all from the Archive at the Fort Collins Museum of Discovery.